A vegan alternative to scrambled eggs OR a hearty protein dish. 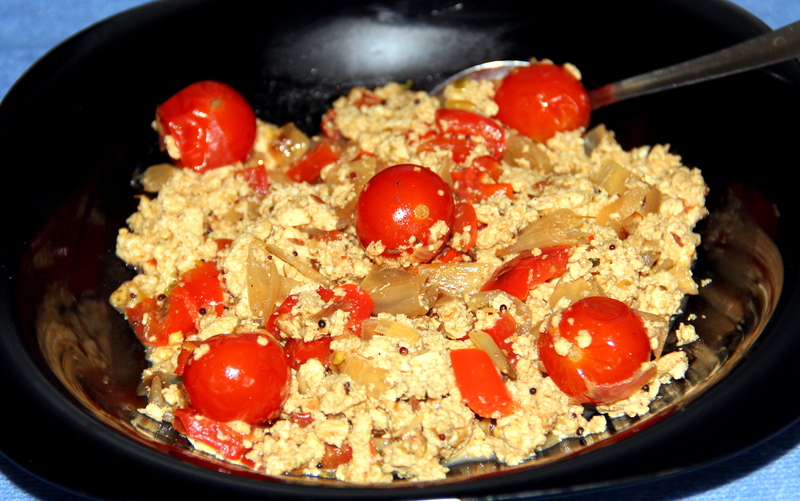 Easy, delicious scrambled tofu has bell peppers, cherry tomatoes, onion spiced chillies and flavoured with ginger-garlic. Scrambled tofu makes a delicious breakfast or lunch. You can personalize it any way you choose, with extra veggies, extra spices, a topping of hot sauce or by wrapping it in a tortilla for a breakfast burrito. I served with Carrot dosas, healthy variation to Masala dosas as a filling and it tasted great.